NAIROBI, Kenya, April 16, 2019/ — Greenpeace Africa (https://www.Greenpeace.org/africa) activists and volunteers delivered a #PlasticMonster partly covered with Nestlé branded plastic packagingright back to its source: the Nestlé factory servicing Kenya and other East African countries calling on the multinational corporation to end its reliance on single-use plastic. Activists also held protests at Nestlé offices in the Philippines, Germany and other countries across the globe as part of a global day of action led by Greenpeace and allies from the Break Free From Plastic movement. From Manila to Rotterdam, and along the Rhine with a “plastic monster” to Nestlé’s headquarters in Switzerland. 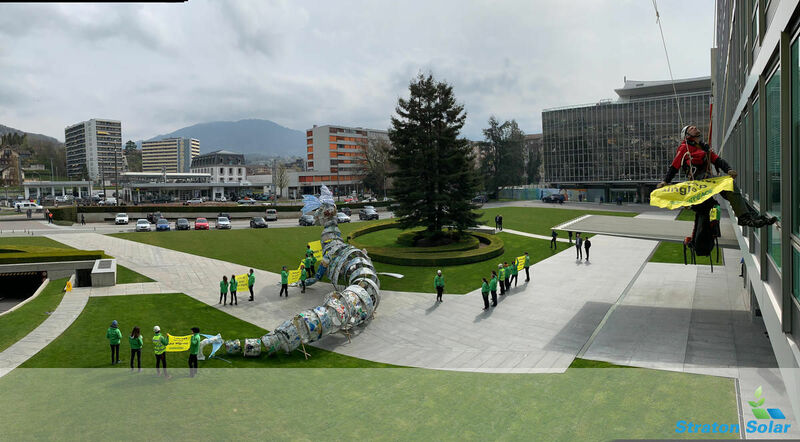 Greenpeace has been raising awareness about the plastic production crisis in towns and villages across the globe. Last year, Greenpeace Africa’s volunteers championed the #BreakFreeFromPlastic movement across Africa, conducting brand audits which found Nestlé to be one of the top 3 plastic polluters in the world! In Africa, Nestlé produces a host of products, ranging from household products to snack items and bottled water. Greenpeace is demanding that fast-moving consumer goods companies (FMCGs) like Nestlé, Unilever, Coca-Cola, PepsiCo, Danone, Johnson & Johnson and Mars be transparent and active in their immediate reduction in the production of plastic packaging while investing in the alternative delivery system of refill and reuse. To date, over 3 million people from around the world have signed a petition calling on brands to take action. Activists also held protests at Nestlé offices in the Philippines, Germany and other countries across the globe.